Emil’s was established in Pompano Beach, Florida in 1954 by a German immigrant that lived up north. He would only operate the business in the winter time when the Snowbirds were here. After about 5 owners and 45 years later we (Walter Voos and wife, Jutta Voos) bought the business in 1999 from Joseph and Susan Lognoule from Belgium. 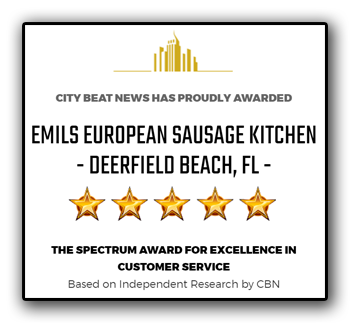 We were very successful in the original location for almost 9 years, but after a dispute with the landlord, Emil’s moved to Deerfield Beach (7.5 miles north) where we opened a larger and brighter store. Thankfully, our loyal Pompano Beach customers followed us to the new location and are joined by new Deerfield Beach customers every day. We are blessed to have such wonderful customers who help keep the tradition of Emil’s alive and well for 6 decades and counting! Walter Voos, head meat man. I, Walter Voos, am the oldest son of a Military War Veteran. 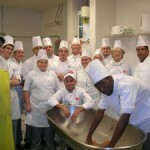 I learned my trade in Buettelborn, Germany about 20 miles south of Frankfurt. After 3 hard years of trade school I went to work for a German supermarket chain as the youngest meat market manager at the time. In 1982 I began to work for the Dept. of Defense in Rhein Main Airbase (now closed) as a meat cutter and at 22 years of age, I was announced as work leader of about 17 other meat cutters. After 9 years in Rhein Main, I was stationed at a few other military facilities. 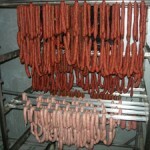 In 1997 I was picked from the top 5 to assist in the opening of a very large meat pressing plant in Ramstein AB. We processed over 11 tons of meat each day for facilities where military were stationed with the exception of the U.S., England and Asia. 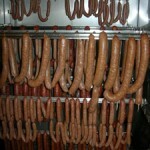 In 1999 we moved to South Florida and began the journey with THE REAL EMIL’S SAUSAGE KITCHEN. 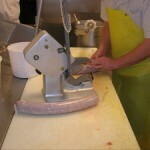 In our new store (In operation since 2008) we are manufacturing over 120 items in house averaging over 1,000 pounds of sausage, hams, and meat products produced every week. All of our processing and smoking is done on premises with the freshest quality ingredients to bring you an all-natural product with NO MSG, NO preservatives, NO flour or sugar, and NO nitrates. We create the freshest meats, sausages, and European specialties using Old World recipes handed down from generation to generation. Our South Florida store brings a taste of Germany to Deerfield Beach with an international selection of imported groceries such as German chocolates, cake mixes, cookies, preserves and jams, canned and jarred goods, mustards, and magazines. If you’re looking for a specific item or a special order, give us a call and we will do our best to meet your needs! 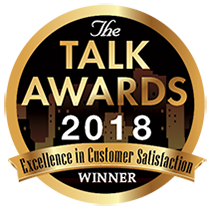 We are honored to have been featured in several local publications. As a self-proclaimed “military brat”, Walter honors army veterans by supporting many military causes and charities. Emil’s is partnered with Veterans Foundation FL to provide free “Welcome Home” banners to the troops. Inside the shop you’ll find donation jars for several local charities supporting two of Walter’s favorite groups: veterans and cat rescue. 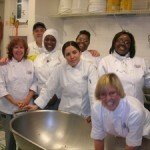 Emil’s also serves as a classroom to up and coming culinary students of the Florida Culinary Institute and Lincoln Culinary Institute.